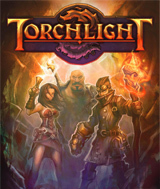 Torchlight is an exciting new action role playing game, from the designers and leads of Diablo®, Diablo® II, Fate™, and Mythos! This hack-and-slash adventure is set in the mining settlement of Torchlight, a town founded on the discovery of a rare and mysterious ore called Ember. This valuable ore has the power to enchant and corrupt but its value is such that many are willing to risk their lives for it. Now, miners have uncovered Torchlight's buried past: a dangerous labyrinth of caverns, monsters, and ruined civilizations beneath the ground that have been corrupted by Ember's dark influence. As Evil threatens to overrun the town, a Champion is needed. Players will have the opportunity to save the town of Torchlight, battling through rock and fire, through lost cities, and across ancient tombs on a perilous journey to cleanse the mines. As one of three Character Classes, Players will explore randomly generated dungeon levels, battle a huge variety of monsters, and pursue endless variations of fame and fortune. The Ember beckons...how will you answer? Comments: My 13yr. old son enjoyed playing this game for hours. Your on a quest trying to defend your home from the bad guys. You use swords, battle, explosions and more.